Given the prominence of a potential vote for a Clean DREAM Act on the congressional docket and the abundance of human rights abuses such as family separation, mass trials, and border shootings perpetrated at the hands of ICE and CBP, constituents have been calling the offices of Texas Senators John Cornyn and Ted Cruz to demand they take immediate legislative action. In discussing the issue on these calls, Senator Cornyn’s office is resurfacing an old lie from 2014 that not only ignores the concerns of constituents but worsens the situation of minors and their families. Cornyn’s office is bringing up an old bill- the Orwellian-titled “Humane Act” (SB 2611 in the Senate) from the 2013-2014 Congress- as a possible solution to child separation. In actuality, that bill does nothing to prevent children from separation. Rather, it pressures them into a 48 hour window in which CBP- the same institution that shot Claudia Gomez Gonzalez- would question children to determine if they need asylum before deporting them at a faster rate than ever before. Many of these guards do not speak any language other than English, and their role is not judiciary; they are neither fit nor humane enough in judgment to make asylum decisions, especially in two days time. An in-depth Vox report from the year the bill was introduced demonstrated that the process guards used to make sure children did not fall into the hands of traffickers was insufficient to the point of immoral negligence. “Senator Cornyn has led the opposition to every single immigration reform proposal he has ever seen and he is exploiting children, wrapping himself in a thin blanket of feigned compassion, and he has gotten a Democrat to stand with him. This is not the middle ground, this is the deportation-only agenda dressed up in sheep’s clothing. More of the same is not a solution. “The backbone and commitment to justice of the strongest and most generous nation in the world is trembling at the presence of 50,000 children and responding by taking away legal rights from vulnerable children. It is shameful. “We could fortify the U.S. Mexico border like the Berlin Wall of the past and it still would not change the fact that kids are fleeing their home countries because of danger and violence. The Congress has an important decision to make, right here, right now: As our nation faces a refugee crisis of desperate children fleeing for their lives and the Western Hemisphere faces massive displacement of children and families, do we want to create a border with Mexico that rivals the militarization of the border between North and South Korea? Is that our response, to shut out our neighbors and stick our heads in the sand? Gutierrez’s statement is as applicable today as it was in 2014, and will remain applicable for the entire career of Senator. It’s worth noting: The “Humane Act” is a clear demonstration that not all bipartisanship is inherently good. Cornyn’s partner in crime for the attack is Representative Henry Cuellar, a Democratic rep known for a long history of harsh immigration policies. Cuellar is the second highest congressional recipient of donations from the private prison industry, taking home nearly $37,000 to date in the 2018 cycle. He comes in second only to fellow Texas delegation representative John Culberson (who has taken nearly $50,000. Tied for 6th on the same list? Senator John Cornyn. This trend continues back in time to previous cycles, when these candidates and other representatives such as Senator Marco Rubio have stacked up sky-high campaign contributions from private prisons, to the horror of advocates and human rights watch groups everywhere. The stranglehold of private prisons on poor community, as well as their influence on the immigration debate is a cancer kept alive by these representatives and other Donor Class puppets perpetrating thuggery and violence in communities across Texas and beyond. The private prison industrial complex is a $3 billion dollar industry that feeds the deportation machine as well as the rest of the prison abuse machine. Geo Group, one of the two largest private prison companies in the world, has two infamous institutions in Texas: Reeves County Correctional Complex, known as the world’s largest private prison; and an ICE Detention Center opened in Representative Kevin Brady’s district (supposedly without his knowledge) in 2017. Meanwhile, Geo Group and CoreCivic (another corporate incarceration giant) are known for forced labor, torture, sexual abuse, drug smuggling– thanks to bribery of prison guards and other personnel- intimidation, and medical and mental health mistreatment. 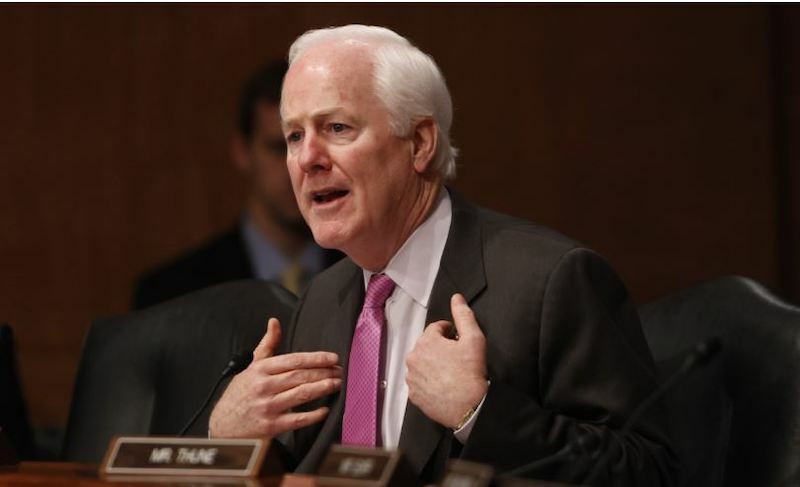 Cornyn’s position is a farcical headfake toward a pseudo solution that will make the situation much worse. The People cannot allow for congressional offices to propagate misinformation that harms children and undermines family valueUnified families should be treated humanely and cherished for their place in the American social fabric. Cornyn, Cuellar, Culberson, and the rest of the Private Prison Caucus must be held accountable. Call and tell your representatives to end family separation and support the DREAM Act Discharge Petition. Also tell them you oppose the HUMANE Act and any other legislation that speeds up the deportation wheel and revs the private prison abuse machine. 2) JOIN US ON AMPLIFY. Stay up to date on all Indivisible Houston Calls to Action by downloading Amply and joining our team. Use your phone to go to https://getamplify.org/install. Once you’re in the app, you can see who is taking action and cheer them on. 3) ATTEND THE NEXT INDIVISIBLE HOUSTON MEETING ON FIGHTING THE DEPORTATION MACHINE. Donate to Indivisible Houston here. Harris County wasn’t ready for Harvey. Has anything changed?